The offseason is a time to incite hope amongst a fan base used to losing, but the perennial-losing Grizzlies showed why they have been stuck in a rut ever since expansion in 1995. A botched run at free agency, cheap contract negotiations, watching valuable players leave and overspending on players have left Memphis fans with an even worse-than-usual outlook of this season. When it came to throwing around money this offseason the Memphis Grizzlies could not make up their mind. These peculiar financial decisions are a major reason the Grizzlies have as much young talent as any team in the conference, but also no clear direction. And these head-scratching decisions by management are nothing new and a major reason why the Grizzlies franchise, either in Vancouver or Memphis, has never won a playoff game. In six years in Vancouver the Grizzlies only finished better than last place one time, and in three trips to the playoffs in Memphis the Grizzlies were swept each time. But the franchise has been on the upswing. It has utilized its poor records to stock up on young talent in the draft and after back-to-back win totals of 22 in 2006-07 and 2007-08, the Grizzlies won 24 two years ago and 40 last season. This offseason was supposed to be a summer of momentum, but then Memphis got in its own way. They stalled in signing two draft picks, Xavier Henry and Greivis Vasquez, by attempting to make 20 percent of the contract performance-based, an archaic way of doing things that no rookie will agree to. The Grizzlies eventually relented, but just recently, and Vazquez and Henry only arrived four days before training camp. Memphis does not have the luxury of easing their rookies into the fire that is the NBA regular season; they need production out their rookies immediately. Vazquez will need to step in for the constantly struggling point guard Mike Conley and Henry at shooting guard will give a lift to a Memphis team that finished dead last in three-pointers made last season. The offseason got worse when Memphis overpaid for O.J. Mayo, but then the team watched as Ronnie Brewer walked and then to make up for the Brewer hiccup the Grizzlies overpaid for Tony Allen. Conley remains at point guard because two-guard O.J. Mayo has proven time again that he is incapable of handling point duties. 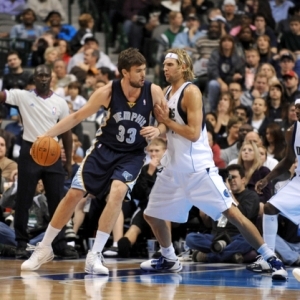 Marc Gasol is at center with absolutely no depth behind him unless you consider Hasheem Thabeet depth. Zach Randolph and Gay are the starting forwards with second-year player Sam Young pushing both for minutes. The Memphis Grizzlies schedule starts at home against Atlanta on Oct. 27. Then Memphis hits the road for five of its next six games, including major road tests at Dallas, Los Angeles Lakers and Phoenix. The offseason was a brutal one for Memphis, rivaling some of the worst regular seasons the franchise has seen. Brewer left and Allen comes in to replace him from Boston. Both draft picks could have an impact but a summer of unnecessary contract negotiations stalled the progression of Vazquez and Henry. The Memphis Grizzlies odds to win the NBA Championship are +8000. Their odds to win the Western Conference are +4000 and their odds to reach the Western Conference Finals are +2000. NBA odds are courtesy of BetUS. The experiment with Conley at point guard continues to blow up in the face of the Grizzlies and the trade off of Allen for Brewer will hurt their depth that is already a weakness of the team. Gay, Randolph and Gasol combine to form an elite front court, but Memphis is still a few pieces away from really contending. A step back from a 40-42 season seems likely.